Welcome to Diesel Weasel, a site dedicated to the diesel submariners of the British Royal Navy. Sadly the Royal Navy's diesel boats are long gone; the future, in their Lordships eyes, is nuclear. The last diesel boats, the ill conceived Upholder Class, were leased to Canada in 1998. Although this perhaps made sound strategic and financial sense on the behalf of the government, it brought to an end an era of submarines and submariners which stretched back almost one hundred years. Fine boats as the Upholders perhaps were, (although the design fault which initially prevented them firing torpedoes argues against this) they were no replacement for the Porpoise and Oberon class, at least in the hearts of my generation of diesel submariners. So now, with the boats gone and their erstwhile crews getting older, if not more mature, I thought I'd commit what little I remember of those days to digital paper. 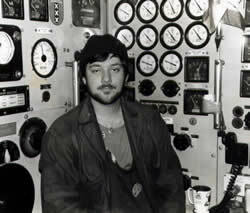 Let me introduce myself, my name is Andy Sugden, I served in the Royal Navy Submarine Service from 1973 to 1995. The main part of the site (Footsteps) is a hazy recollection of my time on one of those submarines, H.M.S. Opportune. Although the narrative starts off on a chronological path it quickly diverts up and down the side alleys of my memory, leaping forwards and backwards over the years. I'd like to thank the many submariners from several countries and navies who have taken the time to get in touchand sent in their memories and pictures. I'm always glad to hear fellow 'Diesel Weasels so if you have served in diesel boats and have a story to tell, or some images to share, please e-mail them to me. I have, in some cases, been careful not to name names, this is to protect the guilty in case their wives, sweethearts, children and, let's face it, grand-children should happen to surf by. I hope you enjoy the site and pass on word of it to any ex-diesel submariners you know — when they sober up.